This blog is about reconciling the two worlds of disability understanding. On one side are the strong voices of activists in the disability community. On the other is the well meaning but naïve/ ignorant able bodied population who see disability as something pitiable. As an able bodied person who has realized the very compelling and interesting arguments about society and life coming from the disability community, I am compelled to referee the exchanges between the two sides. Often times it seems that everyone is speaking so loudly and with such great conviction that the other doesn't even listen. Since I am not personally motivated by either side, I can weigh both sides of the arguments and hopefully facilitate an open and accepting space for both sides to express themselves and learn about each other. Please join the discussion! The New York Times had an article about the state's new governor, and I was pleased to see good coverage of a person with a disability. "Mr. Paterson spent the weekend drafting the speech, rehearsing it and committing it to memory. Because he is legally blind, he does not have the luxury of being able to read from a teleprompter. So his remarks will be partly memorized and partly improvised, aides said." This is good coverage because this was really the only mention of his blindness in the whole article. It doesn't gloss over it, but it also doesn't make it a big deal. The same is true of the article in the Chicago Tribune. See media... that wasn't so hard, was it? In an article entitled "So What about the Blind Thing" in New York Magazine, they notice the lack of disability centric coverage. 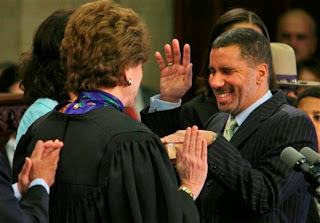 "So far, David Paterson's blindness has really only cropped up as an aside in news stories about New York's soon-to-be governor. They're all, 'he's 53 and he's an adjunct at Columbia and he lives in Harlem and he is African-American and oh, yeah, also he is legally blind.' "
I am glad that disability was so overlooked that a publication found it noteworthy to point it out. Its very affirming for me to see. However, this was an easy one. People will always be interested in a new governor. The story doesn't need to depend on disability to make people read it, and therefore disability appropriately fades into the background. I'm torn about how to deal with this story in the New York Times. It has 'So Courageous!' written all over it, but I can't help but love it. "[Dustin] Carter, 18, is a 103-pounder whose legs end at his hips, whose right arm stops just after his elbow and whose left arm is even shorter." In this story we learn that he has won enough matches to go onto the Ohio Division II wrestling competition. "When time finally ran out during his consolation semifinals match against Dustin Davidson, the scoreboard showed a 3-1 victory for Carter. Knowing the victory had landed him in the state tournament, he scurried to the middle of the mat, lifted his head toward the ceiling and roared. Not once, but twice. His family, wearing buttons with pictures of Carter, surrounded him as he galloped to his father and leaped into his arms. They cried into each other’s shoulders. The friends and family who surrounded them shed tears, as well. 'I don’t think I’ve ever felt such elation in my life,' Lori Carter said, struggling to keep her voice steady. 'He’s worked so hard. After everything he’s been through, he deserves his dream.' "
That's the real story here. For months now, I have railed against the media for what I see as the limited, ignorant, and harmful way peoples with disabilities are often portrayed in the media. I wanted now to offer a simple vision of how things could be. Principle 1: The media offers great power to increase awareness; use it. Peoples with disabilities should be frequently presented in media stories. Media offers a valuable channel through which to make the general population familiar and comfortable with, the visual indicators of disability. This principle is already widely accepted, and peoples with disabilities are frequently presented in the media. This should continue. Principle 2: Educate through example. If we want peoples with disabilities to be treated the same as everyone else, then we must present them in the media the same way as everyone else. Stories should be about something notable or interesting they accomplished to further (or detract from) their community or a particular idea, or any subject that portrays the person as more than just a disability. I was very pleased to find an example of my vision already realized in the world, and I wrote a post about it a while ago. Kudos to Crains Chicago Business for hitting the nail on the head. This story is about a man opening a new bank that would be designed to serve disabled people or those who have trouble leaving their homes. It is presented as a new idea which might find a strong market. It is also mentioned that the entrepreneur has a disability. Thanks to Ruth at Wheelie Catholic for this story about being interviewed as a disabled tennis player. She recounts her frustration with never being seen as more than a disabled person that played tennis. Reporters weren't interested in the rest of her life or who she was. "There was no way, it seemed, to get across the real story which was that I played wheelchair tennis as a weekend warrior, competing at tournaments during the spring and summer for short two or three day trips, while working. The reporters didn't want to hear about my other life - the real job I had and all the other things I did with my life. Such mundane facts seemed to put them on overload. One reporter put his pen behind his ear and just stopped writing. Another held up her hand and asked "Do you all play tennis or do you have a job? Which is it?" as if I couldn't do both. The resistance to any real facts or information was pretty strong. Somehow no reporter ever managed to write a story about who I was over the decade I gave interviews. I guess that story just wasn't inspirational enough. You see, I'm not really a wheelchair jock. I practically flunked gym in school. The only reason I have a wall of trophies for wheelchair tennis is because after my hands were paralyzed and I couldn't play classical guitar any more I got so mad I duct taped a racket on and started hitting tennis balls around one day. A coach saw me. He mistook my anger for athletic aspiration and set me up with lessons. And the next thing I knew I found myself competing in a tennis tournament. Oh, except for one thing. 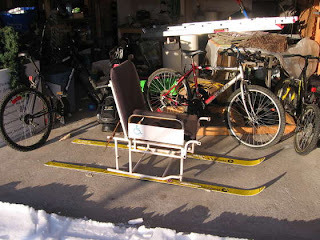 I managed to win a cross country skiing event too one year. How did that happen? Don't even ask. But there is an article about it somewhere. And you can bet it was very inspirational." Its great to have the subject's perspective on the So Courageous Phenomenon. Reporters don't really want to get to know them, they just have a story to tell and need information to support it. I'm sure most reporters do this with all their stories, not just with those concerning the disabled, but it's kind of scary to think that we can all be so quickly reduced to cleanly packaged inspiration and hocked on the media markets to attract viewers. This ranks right up there with the crutch locked to the bike rack in my profile photo. I recently saw this post at Planet of the Blind and wanted to share it with you. I'm always pleased when other people echo the ideas I'm trying to convey. Thanks Stephen! "...Over time the mere act of talking about the conditions of marginalization becomes a secondary form of abjection... No sensible person would advocate avoiding the use of civil rights language, whether we’re talking about women’s rights or Latina rights or African-American rights, or children’s rights. Yet it seems to me that I am increasingly uncomfortable as a representative of "the disabled community" or "the blind community"—not because I would eschew these political realities, but because the insistence that these are my subjects prevents me from being publicly a more reflective or complex person. I have a sensibility that’s different from what you might suppose... I am not a blind person when I listen to the opera or swim in the Baltic...My feeling is that we must go beyond identification based on race or disability or ethnic origin or gender or sexual orientation for only in so doing can we rebuild a progressive and thoughtful means of public engagement in our nation..."
I couldn't agree more. One thing that I'm particularly interested in is the way we might accomplish this. How do we advocate for disability rights while at the same time not being a person whose sole persona is "Mr./Mrs. Disability"? How do we change something without talking about it? The only answer I have is to initiate change by example, or as Ghandi said, "Be the change you want to see in the world." One of these days I'll get around to showing you what I mean. 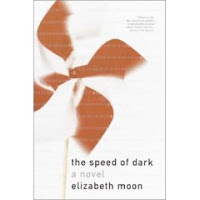 The Speed of Dark, by Elizabeth Moon, is built around the question, “What would happen if we had a cure for autism?”. Knowing that the issue would be the central debate of this novel made me suspicious, fearing that it would overdo the disability angle and result in some sappy conclusion. Initially the argument was overpoweringly obvious, but soon the characters overshadowed it and took me to a surprising place. The narrative was crucial to teasing out all the subtleties hidden in the question I raised above. The resulting discussion was honest, subtle, and comprehensive. Ms. Moon used characters to represent different points of view e.g. the boss who thinks the autistic workers would be better off without their disability, or the friend who sincerely appreciates the main character for who he is, autism included. These characters are one-dimensional and don’t make for the best literature, but they facilitate the discussion. Toward the end of novel, I forgot that it was exploring this conundrum and focused on the very human, multidimensional, main character making choices about his life, the way anyone would. In my past foray into disability literature with Planet of the Blind, I was impressed because while the book educated about disability, it also related on a simply human level; a fundamental commonality that we all share but which seems to be sometimes overlooked in the presence of disability. The Speed of Dark happily achieved the same connection because of the strength of the main character. Ms. Moon does an excellent job conveying his autistic style through the text, and I found myself quickly growing accustomed to it and feeling like I knew him. The greatest reward from this book is to go on a journey with the main character, see the choices he makes and why, and become more intimately connected with someone with autism. As for the greater question, we are left with a more complete understanding, but gladly no answer. What are we finding Courageous Today? Add to Technorati Favorites Who links to me?